Chief is set to debut several new solutions at ISE stand 2-C50. The Impact On-Wall Kiosk aims to bring increased flexibility to the digital signage enclosure market, while maintaining a sleek aesthetic to complement a variety of environments. A depth-adjustable exterior frame allows for a variety of display sizes. Reversible hinges help to avoid installation and service obstructions, and a special design keeps the display mounted to the frame when opened, providing easier service and maintenance access. "This kiosk is the first co-developed solution with Chief and Middle Atlantic," said Luke Westin, product manager at Chief. "We were able to leverage the strengths of both brands to create an amazing product our customers were asking for." Integrated engagement latches can be secured with tamperproof hardware to protect equipment. Multiple storage options can be added to mount components in-wall and/or on-wall leveraging Middle Atlantic's Lever Lock technology. Continuing Chief's increased focus on digital signage solutions, the TiLED Series is a modular, LED mounting system designed to support creative video wall configurations. The system can include any of three mounts supporting one, two, or three LED displays that connect together to form a seamless video wall. "As creative as you are with the content, you can be as creative with the supporting structure as well," said Kathryn Gaskell, manager, product managers. "We want to support AV companies in providing the unique experiences that make them shine." Built for the Samsung IF Series, integrated plumb adjustment helps to compensate for imperfections in the wall, keeping everything flat. Offset mounting slots allow for easy installation and protect LEDs from the damaging friction that can occur when display edges rub together. Lastly, an addition to display height adjust will debut at ISE this year. Chief's line of height-adjustable display mounts is expanding to include electric solutions. 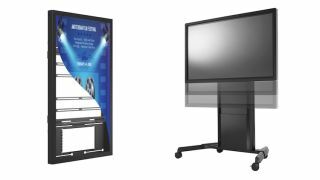 The new cart, floor-support, and wall mounts bring higher weight capacities to support larger interactive displays, and also give an option to users who may simply prefer an electric solution over non-motorized. For safety, the electric solutions features anti-collision technology, which immediately halts, then reverses motion upon encountering an obstruction to avoid pinching fingers or damaging the display. The series also boasts sleek aesthetics and integrated cable management.